So easy and great for a breakfast or packed lunch. You can even prep these the night before, ready to pop into the oven in the morning. I add whatever vegetables that need using up in my fridge – peppers, spring onions, courgette, tomatoes or spinach. 1. Preheat the oven to 190ºC/gas mark 5. 2. Place the eggs in a jug with the butter, milk, herbs and seasoning. Grease your muffin trays. 3. 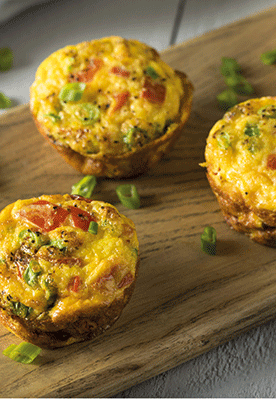 Place your finely chopped vegetables and grated cheese in each muffin in the tray. Pour over your egg mixture until they are two-thirds full. 4. Pop into the oven and bake for 20 minutes until golden. They will rise but sadly drop again once cooled. Don’t worry, they still taste divine!